You asked for it – so here it is! 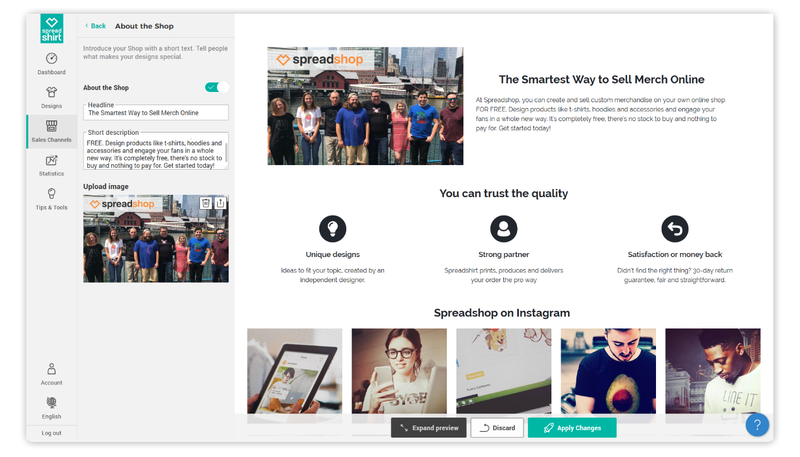 Your Spreadshop start page is ready to go, giving you the possibility to welcome your customers to your Shop with a customized start page that’s totally down their alley. The start page is a perfect figurehead to arouse your customers’ curiosity. The teaser gives you the chance to reveal more about yourself. 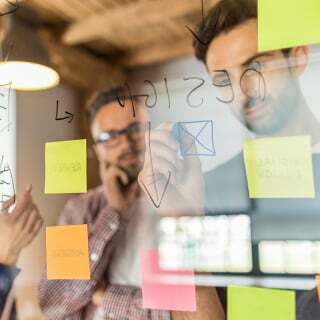 Use a fitting headline and background image to make your customers want more. Customize the call-to-action button to lead them straight to a product category that you can choose. The product preview is your shop window. Here you can put your goods on display. The best part is the ability to freely arrange and sort the displayed products – as long as you have at least 5 products in your Shop (Page Settings > Product List Page > Arrange items). 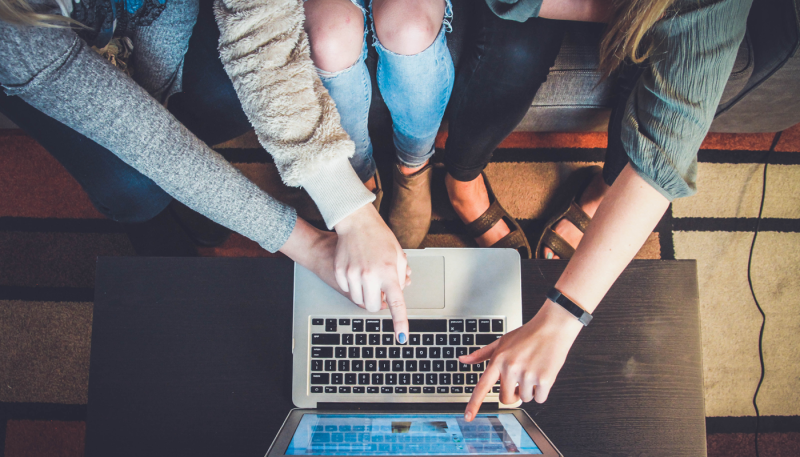 This option comes in handy when catering to seasonal demands (think holidays), as you can customize headlines and buttons to provide a targeted incentive for your customers to buy. 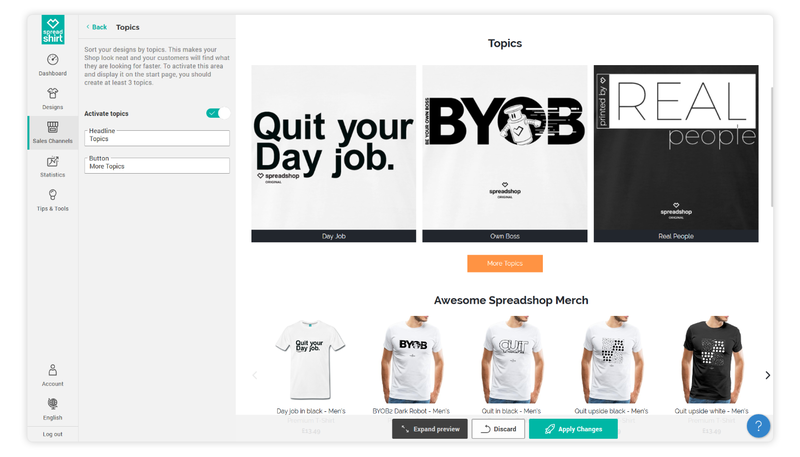 With the topics option, you can now arrange your designs and present your offer in its full thematically diverse range. 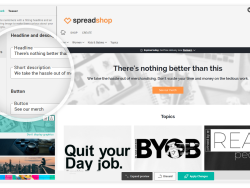 This makes your Shop more accessible so that your customers can quickly find what they are looking for. You can decide for yourself whether you want to make use of this option. 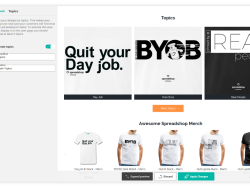 Getting the word out about your brand and your Shop is the be-all and end-all of your biz. 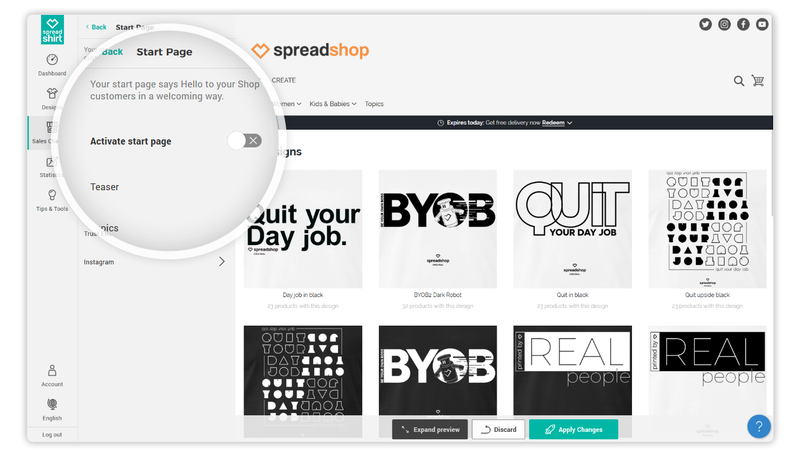 In the About the Shop section, you can let the world know more about yourself, your team or what’s close to your heart. Set further visual accents by uploading a picture that suits your agenda. And if you’re running a lively Instagram account, you can connect it to your shop from October onwards! 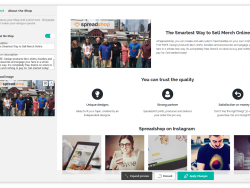 The first 10 images of your Instagram feed will be displayed when your customers access your store on its desktop page. On tablets, the first 8 images will be shown. 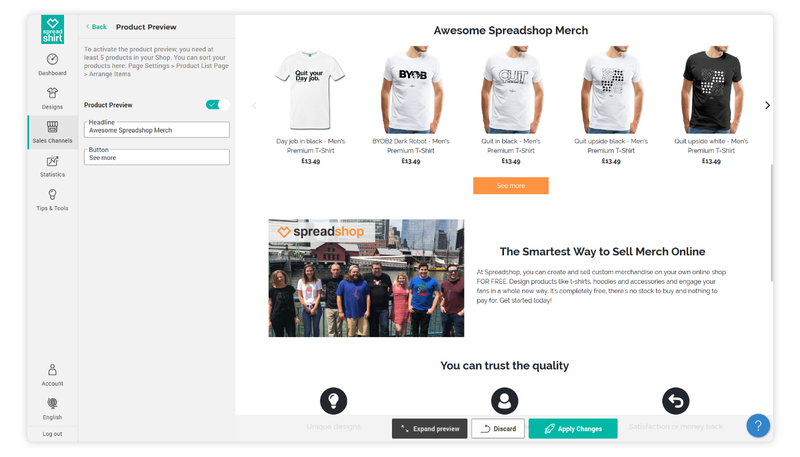 To evoke trust and let everyone know that they’re in good hands, display the Trust Elements in your Shop. 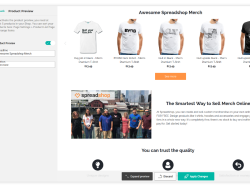 It’ll lay down a marker of trust that Spreadshirt is a strong partner at your side who takes care of the printing and shipping of your products. Please note that the start page is initially only offered in one language at a time and that its contents are not translated. Of course, we know that this is quite important if you run your Shop in different languages. “Can’t you fix that?”, you may rightly ask – and we’re trying to sort it out as we speak. 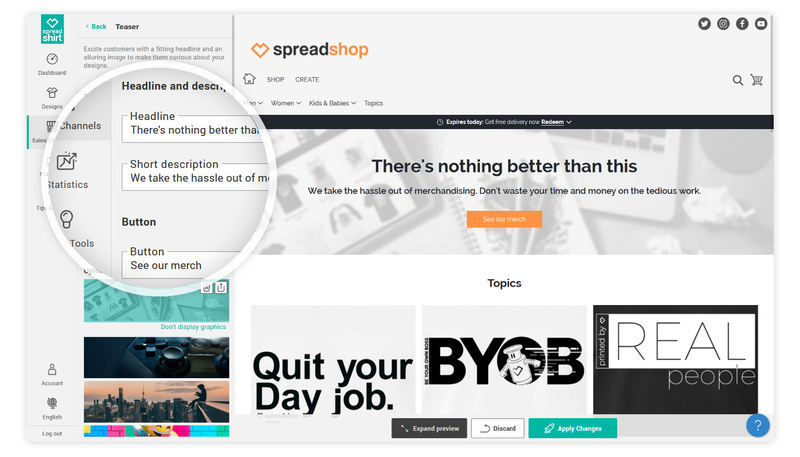 With the launch of the start page, we’ll be reworking the complete header area in the Spreadshop within the next few weeks. The old header graphic will be replaced by a smaller area where you can set up your logo (among other things). We are very happy to have launched this great new feature. What do you think about the start page? Please check it out and let us know what you think. Is there are feature you’re wishing for? Let us know! neither in our EU nor in the US shop the Instagram feature is shown. It will follow in the next few days. I keep you posted! How can i adjust the colour of the text above the main graphic? It’s black and I want to have it in white. Thanks Lena. I started watching the tutorial before I contacted you, but got impatient and forwarded ahead. I obviously missed the section about Page Settings. Sorry. Hopefully the migration is sooner rather than later. Thanks Lena. I went into the shop admin before I contacted you, but couldn’t find it. After your response, I finally found it under > Page Settings > Start Page. Hopefully this helps someone else. Also, are the old shops ever going to get the ability to view Sales Channels, Tip & Tools and Statistics like the new shops have? And yes, we are working on a migration so you can also use these features. But this will take some time. 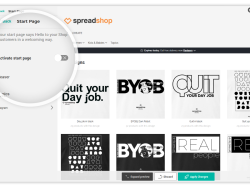 So once again, this looks like these cool features have been designed for everyone that has the new Spreadshirt shop format. If so, this doesn’t help all of us that have the old format. How can we (old shop format) take advantage of all of the new design features, sales data, etc that would help improve our sales? I would love to see the sales data, sales channels and be able to change my shop, etc.